You must make reservations at least 5 minutes in advance of the time at The Chocolate Bar. A decadent combination of dark, milk and white chocolate mousses– a Chocolate Bar favorite! Creamy milk chocolate and buttery caramel with sweet and salty peanut crunch all layered twice over a brownie cake base. Perfection! Dark rich high quality chocolate light but so satisfying. 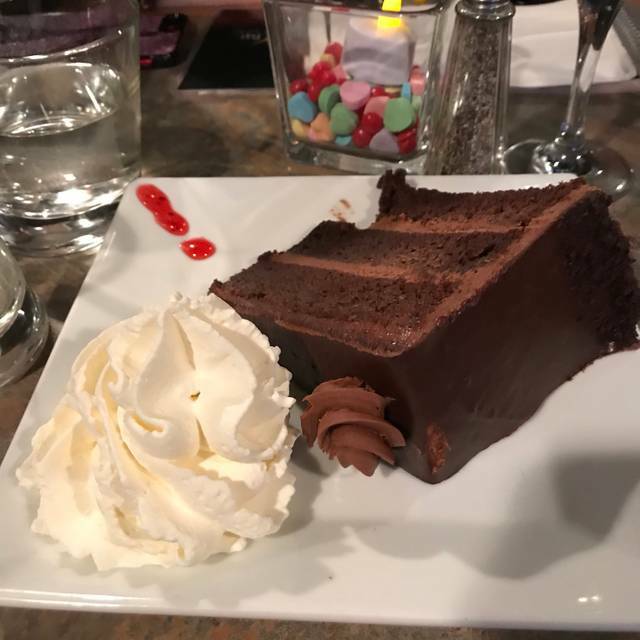 This is one of the most incredible chocolate desserts you ever had! Our decadent crème brulée inside an insanely delicious chocolate mousse atop a moist chocolate cake. Caramelized table side! A delicious chocolate cake with a warm gooey chocolate center. Sensational! Our delicious molten cake with gooey chocolate center and peanut butter too! Toast your own marshmallows tableside and pair it with delicious Hersheys® chocolate, graham crackers and a side of berries. You will be singing campfire songs! Food was excellent but very slow . We all enjoyed our night there. The drinks and desserts were fantastic. No one had anything bad to say about it, other than the dinner menu is a little limited as well as some of the call spirits you may be looking for aren't always available. 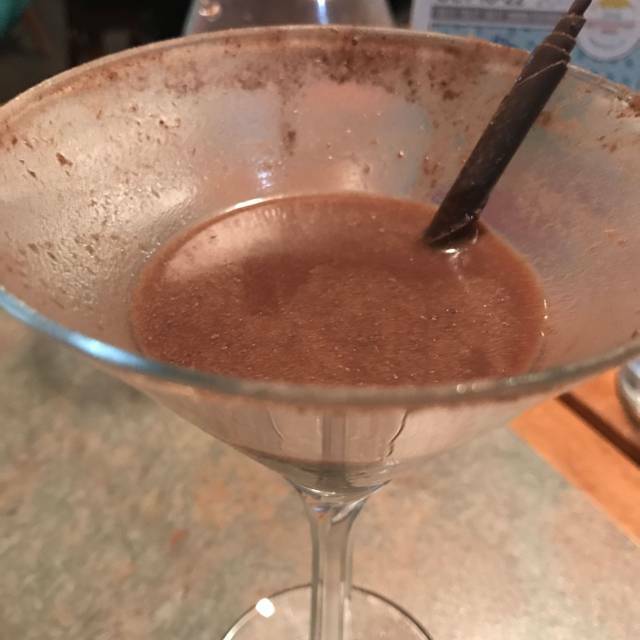 Had a fun chocolate martini before dinner that was super yummy and took advantage of the restaurant week menu. I had the Salmon and my guest had the filet mignon. It was a perfect date night dinner. I think this was my fourth year in a row of partaking in Local Restaurant Week. Their menu is one of my all time favorites. 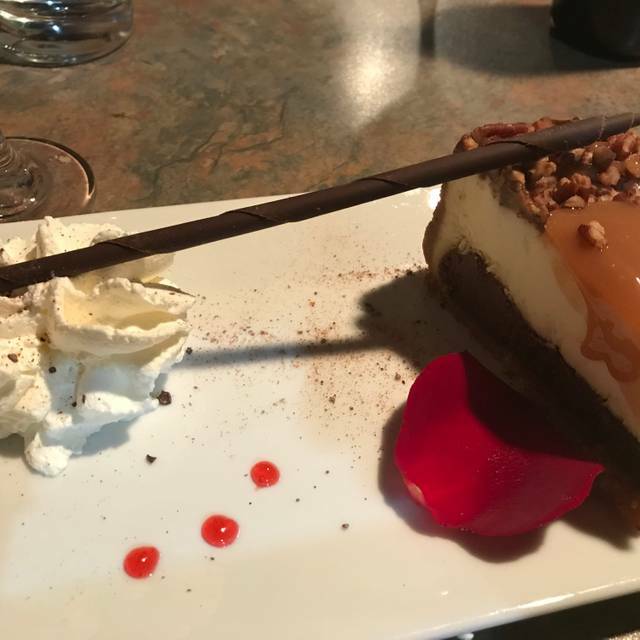 While I am pescatarian, I know all of my friends LOVE the chicken and waffles, I love the ravioli, their desserts are decadent, and their Caesar salad, while simple, is perfect, never overdressed! Food is excellent. Service is always great. Hostess could have been a bit more organized, but it was a crowded Saturday night. Noise level is high, so be prepared. Nothing can beat the excellent menu and great service. DISCLOSURE : it was restaurant week when I went so I understand to a degree, but the hostess was rude first thing when we got in there. Thankfully our waitress (blonde hair, highschool teacher) was very nice despite being super busy with other tables. Food was eh. I got the filet medium rare and it came out basically raw. Like I said though, i understand it was restaurant week so not the best time to come in and dine here for the first time. Restaurant week and the menu looked nice, so we made reservations. We were seated right away, even though it was a very busy & crowded Saturday. Our waitress was pleasant, the drinks were tasty and the food, delicious!!! And the value was excellent! I would definitely go back again! I was upset that I was not able to use my gift certificate during restaurant week. It states that you could not use coupons or discounts but did not say you could not use certificates. Went for resturant week. Food was delicious and service was great ! Made this reservation a few weeks ago for my best friend’s birthday. 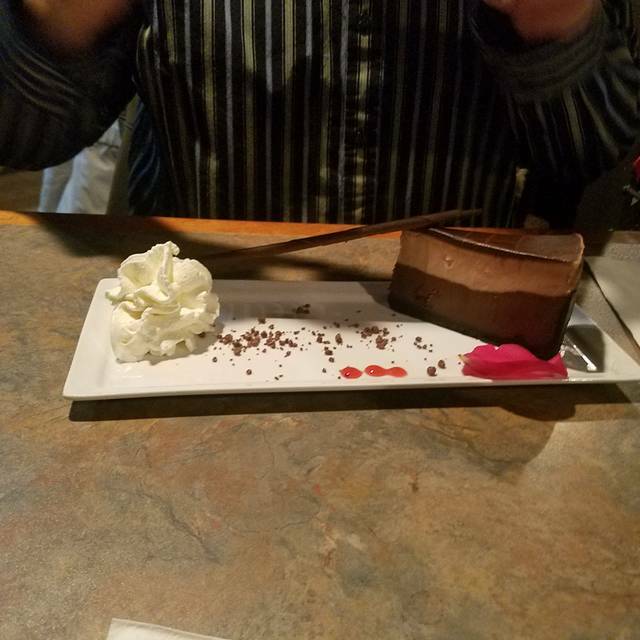 Our intent was to eat dinner, have desserts, and martinis, as I have been several times before and the food has been outstanding. Was extremely disappointed and upset, upon being seated we were unable to order anything but the preset food menu, as well as desserts. This was because it was “restaurant week.” So frustrating we couldn’t order the food we wanted. Especially since we weren’t informed of this event. We had shared the menu among our friend group and everyone was so looking forward to it, but ended up leaving and going somewhere else. Went there for dinner to celebrate our Anniversary which also happened to be during Restaurant week. Made reservations which were perfect, hostess staff was professional and timely. 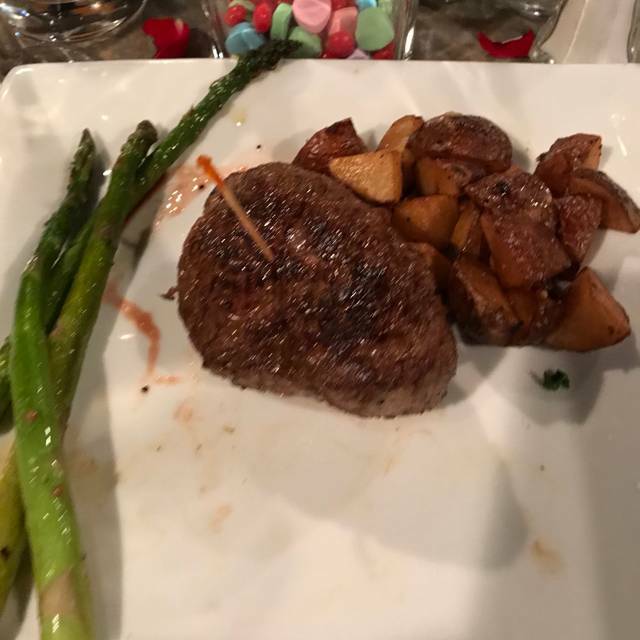 Our waiter was not as impressive, ordered the Steak and Shrimp Meal. Steak medium rare which came out very rare. Brandon immediately apologized and offered to take it back to have it properly prepared. It was brought back cooked on the outside but still quite rare on the inside. I did not complain, I just accepted it. It was then that I noticed that I did not receive my Shrimp. Brandon once again apologized and rushed back with them. For $11 those three Shrimp were quite small. Disappointed. Dessert time, I ordered a decaf with my dessert which was rushed out, and I waited for well over 10 minutes, no Brandon. We finally flagged down Liam, our water guy and told him that we didn’t my decaf and cancelled the coffee. Shortly after Brandon stopped by and apologized once again. He told us that he would take one of the beers off of our bill. Brandon brings the check and the coffee charge is on it. We tell him and he apologizes and takes the charge off. For the money we spent we were not impressed and will not return. Very disappointed. are sever Ashley was great! so nice , great food. we were in and out within and hour. 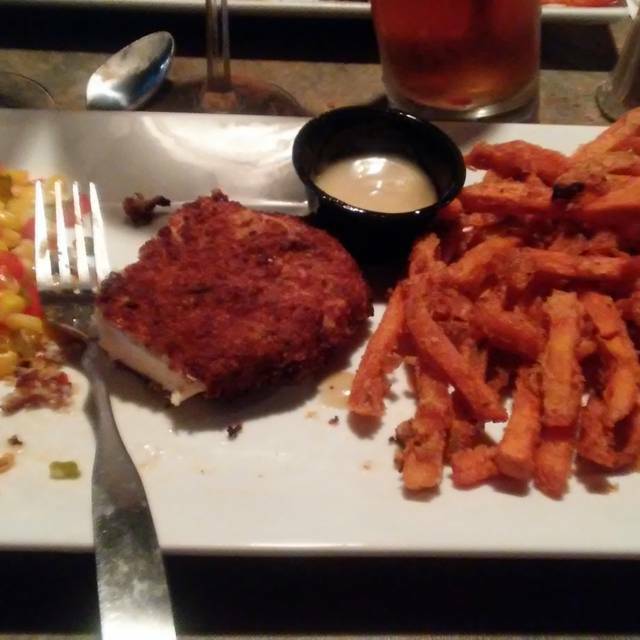 food is always delicious here, service was friendly and attentive, even with a full house. very loud, but what isn't these days. keep up the good work! thanks for another delicious dinner. Our waitress Ashley was Amazing!!! The food was good, seating is a little tight for my liking... Shout out to Ashley!! The table settings were very tight. There was limited space from patron to patron. Overall, the food was good. Service was good. I would eat there again. Went for the first time during restaurant week. Overall great experience. Will definitely be back. Fun atmosphere..
Love this place. Always delicious food at an affordable price. Not unless you have tons of time to kill. Arrived on time for a 530 reservation, the place was so uncomfortably warm tbe windows were steamed up, at 645 still no food.....had to ask server to just box it...not able to enjoy a nice dessert and coffee. It was not overly busy either. We were offered nothing but a gratuitous apology. I do like the food here, but have never received acceptable service... so I'm finally putting it in writting. We waited an hour for food and it came out undercooked. The restaurant was not busy and it was 5:00pm on a Sunday. No real excuse. The manager didn't even realize we had waited an hour when we asked to see him after we sent our food back. It was a sandwich and a crepe. How do you mess that up? The food was very good and will definitely go back. The hostesses were friendly and our server was great. The downside was it took a long time to get our dinners and they need to clean a little better, bar stools look like they haven’t been cleaned since they were moved in! There were 2 problems that I had. 1.) the tables were way too close together on the top floor. It felt as if I was at the same table with the people next to us. 2.) All myself and my mother ordered were 2 flatbreads and we waited an hour and a half for them which was far too long of a wait. Our retirement party of 6 arrived on a quiet Sunday at 5. We were seated immediately. Our waitress, Cassie, was very attentive, informative & friendly. We loved the drink & dessert menu & found the entree menu varied & just as appealing. Our special occasion was made even more fun at The Chocolate Bar. Thank you! 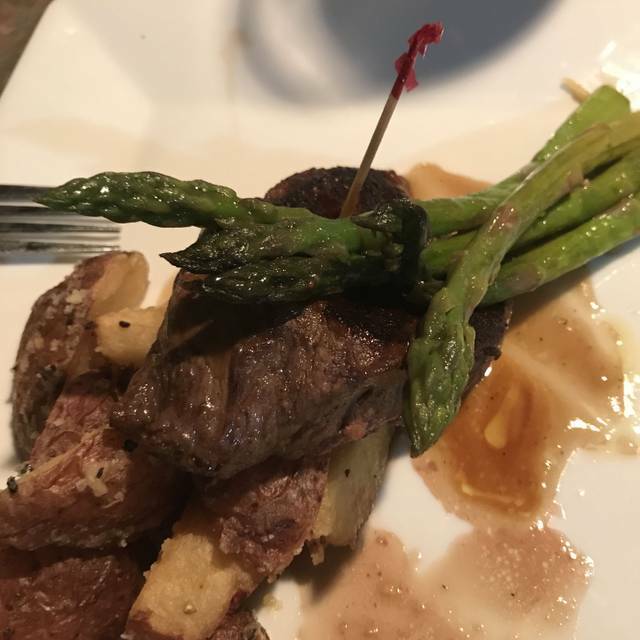 My wife and I were highly confident when we made 6pm reservations on a Saturday night that our experience was going to result in recommending to our friends. Unfortunately, the entire evening resulted in us walking out after 90 minutes of feeling ignored and underserviced at every step. We arrived on-time with only, at best, 1/4 of the table occupied and it seemed that the hostess was not knowledgeable of either our reservation or the process. That was promptly addressed by seating us in a central table location in their upper section. We watched as several servers greeted and took orders from all surrounding tables except us. After 15 minutes passed we were able to flag down a server to ask who was assigned service to our table. The response was an ambiguous, "well I can but I thought another server was". She apologized, offered a complimentary shooter, collected our additional drink and meal order in less than a minute. It took her another 10 minutes to bring a simple 2 drink order and another 10 minutes for starter salads. 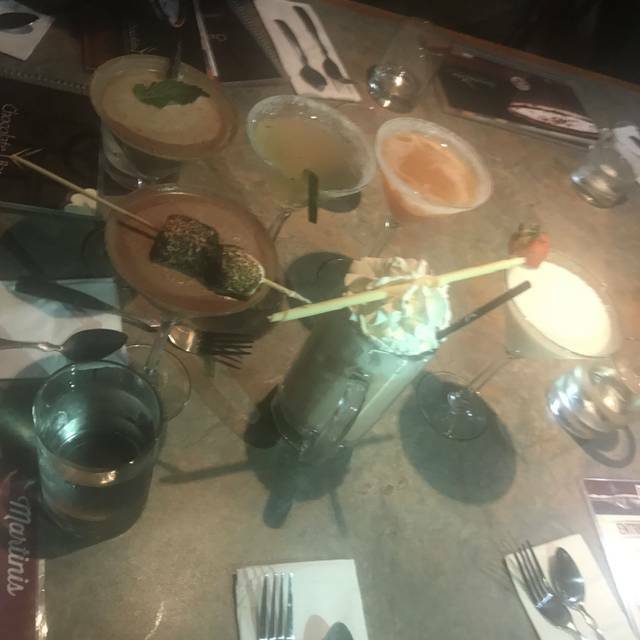 Throughout the next hour we talked and watched as all other tables progressed through drink, meal and dessert deliveries even those seated after us. Our server sporadically came around to ask if drink refreshers were needed and to inform us that our meal would be coming in minutes several times. After 70 minutes, we approached another server at the bill register station and asked to speak with the manager on duty. We then found our server to inform that we would no longer be waiting any longer for our main course and would like to square up our bill. The manager never presented himself during the time it took to itemize and pay our bill. With several times to course correct, the entire front and back of house staff never recovered from a disastrous experience that tested our patience. The service was SOOOOOO slow. It took30 minutes to bring chips and salsa to the table. The restaurant itself was nice but the upstairs level was way too hot, it felt close to 90 degrees inside. The warmth made it unenjoyabke to eat and all the waitresses were sweating from running around. Had a reservation which I has to push back but they were able to accommodate us. When we arrived we were seated immediately and the waitress came back quickly to take our drink orders. The drinks did not disappoint. We got spinach artichoke dip for our appetizer which was rich and creamy. We got the pecan chicken and the chocolate bar pasta which chicken. The food took a little long to come out but both entrees were delicious. I would come back again and would recommend to others. One of the Best place to Eat in buffalo, great food, awesome atmosphere, great service!!!! Will def go again!!! Food was great and our waitress was very friendly. Took awhile for our food to get our food but other than that we had a really good experience. It took an hour to receive our appetizers. When I asked our server about it she instantly snapped at me. I’m not sure if she was having a bad day but it was extremely unprofessional. No, the wait was not her fault but she could have came to the table and addressed the wait issue as well as sent a manager to apologize. The manager should have been aware of the issue and had addressed the customers. It will be a long time before myself and my friends return to this establishment if ever. Horrible experience. Had reservations for 6pm on Saturday and upon arriving found out our reservation was given to another group that wasn't even supposed to be there until 6:30. Waited 10 minutes and was squeezed in by the front door. After sitting for awhile, noticed the restaurant looked a little hazy and smelled funny. Clearly their exhaust fans aren't working properly. Waited an hour and a half and our food wasn't even up yet. The place wasn't even that busy for a Saturday evening. Paid for our drinks and left hungry for our 8pm show at Shea's. No apologies or discounts or anything. Several other tables there this evening in similar situations. Some waited over an hour plus just for desserts. This place has really gone down hill. Will NEVER come back and will be spreading the word how horrible this place is now. This is a very small restaurant and can only serve a few people. We waited about 25min for our drinks and an hour and a half for our food. The waitress was very nice and apologetic and the food did taste good once we finally got it. I would not recommend this if your trying to have a nice dinner with your significant other or if you are starving. However if your out with your girls and you want a nice dessert type drink and don't mind waiting for it, this is your place. My martini was very good.